Support game developers who support their fans, otherwise why even bother showing up? Orion is the latest and a special episode in our Crowdfunding Fraudster series, covering the game Orion and its developer Trek Industries. Trek Industries is a special case because they have the gall to tell it like it is. In a way, they’re a bit like Donald Trump. I can’t believe that there are gamers who are defending the money-abusing,?? ?-wiping turds that is Activision who walks all over gamers with annual $60 releases, season passes, $15 map packs, doesn’t involve or listen to them in any way. Without retelling the story all over again, Trek Industries’ game Orion was pulled from Steam following a DMCA complaint from Activision that the game steals assets from Call of Duty. You can read our coverage of that here, but no matter your opinion of Activision, it’s quite clear that they have the legal upper hand. This is normally the part where I’d comment on the description in the Indiegogo campaign, however Trek Industries has conveniently made no mention of their recent troubles. You have to look into the ‘updates’ tab if you want to see the responses copied and pasted from various social media pages. If you look at the Indiegogo page, you’d think that this was just another in-development game seeking funding. 1. what we are missing out on the largest event. 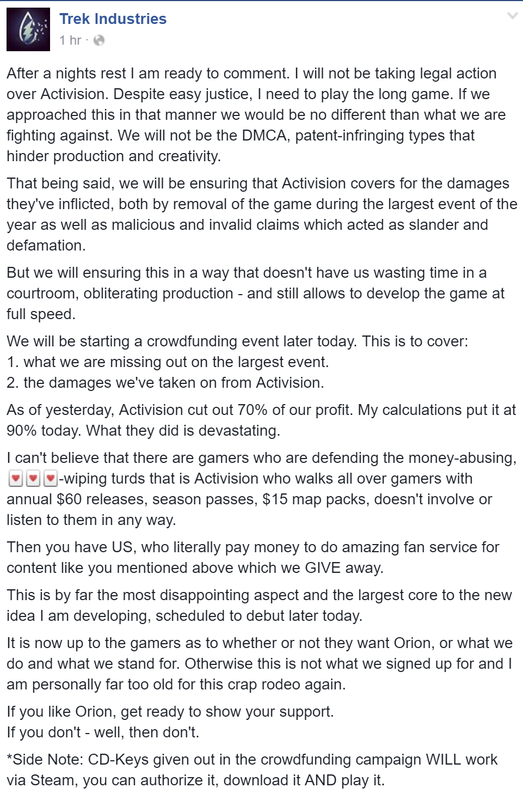 2. the damages we’ve taken on from Activision. As of yesterday, Activision cut out 70% of our profit. My calculations put it at 90% today. What they did is devastating. So since Activision shut down Orion’s Steam store page, and thus their ability to reap in that sweet Steam Summer Sale money, Trek Industries is going to have their own summer sale. With blackjack, and hookers. A successful crowdfunding campaign at that because, if you look at our header image, all $500 has already been recouped, and by one donor even! Who is this generous fellow? Oh. In preparation for the future In Plain English column, Trek Industries was kind enough to present us with the documentation that they’ve been contacted by an outside litigation counsel representing Activision. The firm is Mitchell Silberberg & Knupp LLP. For his part, Tek Industries’ own David James is claiming that Activision has not sent him any details on what they want removed from Orion, making it impossible to know what the DMCA is targeting. Given recent threats by Trek Industries against the press, and numerous attempts to dodge questions regarding weapons, MMO Fallout has opted to not contact Trek Industries regarding this story. MMO Fallout is attempting to contact Activision’s retainer and will update with any further information. We have also contacted Indiegogo in regards to certain aspects of the campaign. Totalbiscuit covered a previous scandal from Trek Industries, including allegations of impromptu firings, astroturfing, and re-releasing their game under new names to dodge poor reviews.